In my humble opinion, this is the BEST forex trading software EVER. Delta fits my trading needs and style like a glove and it’s super simple and easy to use. Over the past 15 years, i’ve bought and used quite a number of forex systems and software and I was hesitant to buy this one, but I was familiar with the author of this system and took a chance ... now Delta is all I use and I haven’t looked back since. I’m in the US trading on Nadex but I use the standard MT4 forex charts and software to get the signals and am doing quite well on it. With this software, I’m actually able to look at the charts, see what the software is pointing out, and tell in just a few seconds whether it’s something I’d be interested in taking or not. That is the very first time that has ever happened to me. Every other system I’ve ever bought I’ve struggled with understanding what I’m seeing and what I’m trying to look for. It’s always been an uphill battle that I’ve never been able to win. Now, with Delta, I’m actually making money and turning a profit and that’s something I’ve never been able to say about any other forex system I’ve used. This is truly a great system and I wanted to express my sincere thanks and appreciation to Yordan for sharing it with us. One of the best tool ever to learn the real way to trade and to wait for the best opportunity ! All the webinar are really well done and simple to understand for anybody ! I really do recommand Delta Fx ! I am proud to use it and it already chance my life and my trading style ! An excellent momentum & divergence based software with advanced money management features. I love the scanner based signals provided via either email or push notification ! In addition to the Signals, simple trading and trade management (1 button click trading on signal) FX Delta will be a welcome addition to the arsenal of most seasoned traders. I find that the scanner and alert to the identification of the Delta pattern alone to be worth more than the cost of the software. Any experienced trader may use the Delta pattern, find their own setups, and trade according to their rules. Quite handy and helps one focus on what the market is doing at the moment with respect to divergence and other factors. I am quite glad I purchased it and am part of Team Delta! FX DELTA is AMAZING, It Just BLOW MY MIND!!! I bought FX Delta on July 15, 2018. On the first day no setup to trade, on the second day I got 2 signal from GBPAUD and USDCHF and I took it. Everything is so easy, FX Delta is analyzing the direction I need to focus on automaticly and also searching for most profitable and efficient entry for me, all my job is only waiting for alert when the setup is found, set the TP and SL and open the position, super super easy..:D And on the third day which is today July 18, 2018 all two setups I took ended up in profit, GBPAUD got me 123.6 pips and USDCHF 108.6 pips which is in total I got 232.2 pips and gain 2.4% in two days only by waiting FX Delta tell me the right time when to buy or sell.. 100% happy with this System, I highly recommend..!!! FxDelta is Unique and Very Powerful! FxDelta is now the ONLY software I have placed on my MT4. All other software has been deleted because I don't need them anymore. FxDelta has changed the way I trade due to it's advanced algorithm in detecting patterns and divergences. There is NOTHING like it that I have seen. 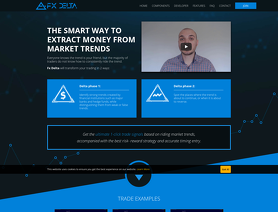 Now that you know about FxDelta, why not try it? "Delta" its beauty is its brilliant simplicity. I just got the FX Delta system a few weeks ago. The first week I got 10 winning trades and no losses and a 2% account gain. But naturally I also did some visual Multi timeframe checking as well, I did not take all signals eyes closed. I rather use it as a potential momentum finder. The idea behind the Delta system is just brilliant! Its beauty is its simplicity. It's based on an all instrument scanner that finds Delta patterns, from the scanner you click directely to your chart and it opens automatically showing the signal graphically and you can even choose market or pending in order to improve your risk reward. The signals I send to my Phone from a VPS. This way I make sure to be where the action is. On top of this is the philosophy behind the system an eye opener in order to become a better trader. I must say that this is one of the best systems I ever had. Great Tool Once Studied All the Educational Content that comes with it, would recommend it. FX delta is great piece of software. It's semi automated and it's not something you can just leave running and take every signal that comes but Yordan has produced some EXCELLENT training videos to accompany the product. Through these training videos you will also learn A LOT about the power of divergence trading which is the corner stone of the strategy. Even if you don't use the signals the general trend bias indications are useful to compliment whatever other trading style you have. You have to study a bit but once you understand the concepts (which aren't that hard IMO) this is a VERY powerful tool. I bought Fx Delta last week 7th July 2018 . 3 trades I took based on delta setup were in profit. I have used several forex software but Fx Delta is too powerful compared to anyone currently in the market . Its the best fx software so far. I Recommend it to any forex trader be it a beginner or a veteran trader. Are you a new trader or you have traded for a longer time but has not achieved the success then this new system is just the answer to your wishes. The Delta system is simple, beautiful and efficient. It is probably the best trend trading strategy that has ever been released and with an effective money management built into the system. The Delta strategy is just the best thing that has happened to me as well as a lot of others. Give yourself this option to change the way you are trading.